This page provides information about development decisions that affect Manitoba's public lands and water. Certain provincial government departments and agencies involved in development intentions are listed. Manitoba's environmental licensing mechanisms and processes are provided, with links. Watch News for stories about development intentions. See also Consultations/Legislation for a listing of what's going on in Manitoba. A life cycle assessment (LCA) assesses the environmental impacts of a product and the resources used throughout a product's life cycle; from raw material acquisition, via production and use phases, to waste management (the term 'product' referring to both goods and services). The goal of LCA is to compare the full range of environmental and social damages assignable to products and services, to be able to choose the least harmful one. An LCA offers a comprehensive view that considers impacts on the natural environment, human health, and resources. LCA applications include product development and improvement, strategic planning, public policy making and marketing. and under the Nuclear Safety Control Act, environmental assessments will be moved to the Canadian Nuclear Safety Commission, which is a licensing body not an assessing body. 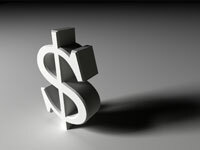 The Government of Canada introduced "Bill C-38: An Act to implement certain provisions of the budget tabled in Parliament on March 29, 2012 and other measures" April 26, 2012. Bill C-38 is the first of two budget implementation acts. Debate on Bill C-38 begins on May 3, 2012 and passage is expected before the end May. The second budget bill comes to the Commons in the fall and becomes law by the end of the year. At 420 pages Bill C-38 is among the longest budget implementation bills ever. Repealing the Kyoto Protocol Implementation Act. Replacement of the 79 page Canadian Environmental Assessment Act (CEAA) with a new 40 page Act, Canadian Environmental Assessment Act 2012 (CEAA 2012), creating a whole new scheme for environmental review, with a much narrower scope. Time limits will be set for assessments, and projects will be excluded from federal review if they are reviewed provincially. Environmental reviews are no longer required for projects involving federal money. Cabinet will be able to overrule both CEAA and the National Energy Board (NEB). Exempting NEB, CEAA, Canadian Nuclear Safety Commission and other federal agencies from requirements to ensure protections are in place for species at risk and their critical habitats when issuing permits. Amending the Species at Risk Act to create time limits on the issuance and renewal of permits. Removing the habitat protection measure in the Fisheries Act. Eliminating the National Roundtable on the Environment and the Economy (NTREE). This is the third time the current Government of Canada has used budget implementation bills to change environmental laws. In 2009 and 2010 the current Government used the budget implementation act to amend environmental laws such as the Navigable Waters Act and Canadian Environmental Assessment Act. Critics aren't happy such fundamental changes to environment law are contained in a budget bill and won't get the scrutiny they deserve. Changes to environmental laws made as stand-alone legislation, are subject to comprehensive analysis, review by the Environment Committee and/or environmental experts, and hearings or debate by members of Parliament. "The legal protection for fish habitat has been completely eliminated," said Jessica Clogg, executive director and senior lawyer for West Coast Environmental Law. "It is an affront to democracy to bury such far-reaching changes to laws Canadians depend upon to help protect our environment in the budget implementation bill in order to avoid public scrutiny," said Greenpeace spokesman Keith Stewart. "The Conservatives are attempting to legitimize their ideological antipathy towards science, evidence and environmental concerns," said Liberal Environment critic Kirsty Duncan. "It's clear the Conservatives are introducing massive changes to our environmental protection laws. Fully one third of the bill is dedicated to paving the way for big oil and development projects," said NDP environment critic Megan Leslie. "Instead of a rigorous thorough process to ensure the environmental safety of projects, we are left with politicians deciding which projects should go ahead," said Green Party of Canada Leader Elizabeth May, adding, "This should have been called the 'we don't care about the environment' act." First Nations are also deeply concerned about being left out of the new procedures, despite legal obligations on the government to consult First Nations on impacts from major projects. "It is an alarming development that Canada would take such steps," said Shawn Atleo, National Chief of the Assembly of First Nations. The Canadian Federal Government used the 2012 budget, released March 29, 2012, as a means of slashing jobs and funding for environmental laws and programs in Canada. Before budget legislation was released, leaked documents indicated the federal government would use the budget to gut protections for fish habitat, and weaken long-standing Candian environmental laws. The British Columbia (BC) Assembly of First Nations, Union of BC Indian Chiefs, more than 600 scientists, and countless Canadians wrote to Stephen Harper urging him to keep environmental laws in place. Yet the budget indicates habitat provisions in the Fisheries Act will be removed. Also, Canadian Environmental Assessment Act (CEAA) reviews will be limited to: 24 months for panel reviews of major projects and 12 months for standard environmental assessments. This condensed timeline will also apply retroactively to the 11 projects currently undergoing review: including the Enbridge Northern Gateway Pipeline. "Environmental assessments need to be thorough, consultative and science-based." said John Bennett, Executive Director of Sierra Club Canada. "Creating hard-time limits and rushing the process compromises all these things." Canadian Environmental Assessment Agency (CEAA) is in line for a 40% cut in funding. Cuts in spending were also made to Environment Canada (6%) and Parks Canada (4%). The National Round Table on the Environment and Economy (NRTEE) has been eliminated for an annual savings of $5.2 million. The NRTEE, established in the 1990s under Brian Mulroney, is a key federal advisory panel on business and environmental issues that produces numerous reports about business, natural resources, government policy and climate change. The federal government provided the Canada Revenue Agency with $8 million over two years to fund "education and compliance activities with respect to political activities by charities". Charities can currently devote up to 10% of their charitable resources to non-partisan political advocacy that is part of the charity's overall purpose. 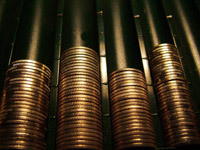 Charities will also have to provide more information on their activities, including the extent of foreign funding. The budget also provides $50 million over two years to support the legal obligation to protect species at risk. The Canadian Senate passed the omnibus federal government budget bill (Bill C-9) on July 12, 2010, with previously deleted sections reinstated. Some environmental groups fear these sections weaken Canada's federal environmental assessment review process. The changes allow the Environment Minister discretion to define scope of environmental assessments. Government politicians praised the budget's passage as just what is needed for a healthy economy, while critics said the government has made it easier for corporations to submit environmental assessments with only limited scope, or to avoid assessment altogether. "This sets us back 20 or 25 years in terms of environmental assessment in Canada. It's a huge step backwards," commented Sierra Club Canada executive director John Bennett. Critics say changes will "gut" the Act, and particularly weaken environmental oversights for new energy projects. Assessments could be carried out, not by the Canadian Environmental Assessment Agency, but by weaker, less experienced bodies. "The whole point of this, it's clear, is to push through major energy project. In the wake of the BP disaster, this is not the time to weaken environmental reviews of offshore oil and gas," said Elizabeth May, Leader of the Green Party . "It will be a miracle if these changes don't result in a disaster in some part of the Canadian environment because of the weakening of the review process." One positive changes is that federal authority for environmental assessments rests with the Canadian Environmental Assessment Agency, whose budget has been beefed up by 60% a year, or $11 million. In winter 2008-2009 Canada's current Government prorogued Parliament, and re opened parliament introducing a budget that included amendments to the Navigable Water Protections Act that eliminated environmental assessments for development projects on Canadian waterways, with very few exceptions. In 2010, after proroguing Parliament December 30, 2009, the Government has again introduced a budget bill that reduces legal and regulatory provisions under the Canadian Environmental Assessment Act to protect Canada's natural environment. In a May 10, 2010 letter to the Canadian Parliamentary Standing Committee on Finance, sixteen conservation and community organizations implore members of the Committee "...to object to these regressive changes that threaten Canada's environment." public environmental assessments for pipelines and nuclear power projects to National Energy Board and Canadian Nuclear Safety Commission, despite no previous experience or mandate to conduct environmental reviews. "By burying these significant changes deep within a towering, 900-page budget bill, the government has deliberately sought to hide these changes from public scrutiny, discussion or debate," says Josh Paterson, staff lawyer at West Coast Environmental Law in Vancouver. "That's why we're asking MPs on the Finance Committee to show environmental leadership by cutting these changes out of the Budget." The Canada - Manitoba Agreement On Environmental Assessment Cooperation(PDF) mechanisms are part of licensing in Manitoba where there is federal responsibility identified as per provisions and regulations of the Canadian Environmental Assessment Act (See our Governments page for statutes, Manitoba, and Canada). The Cooperation agreement outlines the process by which a single environmental assessment occurs that addresses the assessment responsibilities of both levels of government (See section below for further details). Once the CEC has concluded the public hearings, it provides the minister with a report and recommendations regarding the environmental proposal and potential environmental license. 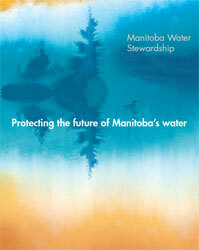 The CEC website provides recent reports on environmental matters in Manitoba. A federal environmental panel can also be appointed by the federal minister. Public registries hold public information and documents required in the licensing process. Public reviews, and comments are also held in the public registries. Applications, scoping documents, and final determinations on licenses are all part of the record. For a full listing of Manitoba public registries go to our Consultations/Legislation page. Manitoba Eco Net provides an electronic listing of public registry documents and file contents. Go to Public Registry on their home page. The Government of Canada is making amendments to important federal legislation governing the protection of, and right of access to, Canada's waterways. The Budget Implementation Act, an omnibus bill tabled February 6, 2009 proposes to radically change the law that protects the navigability of Canada's rivers and streams. The amendments are intended to limit applicability of the Navigable Waters Protection Act (NWPA) and, hasten the approval process for projects that might interfere with navigation. Proposed amendments to the Navigable Waters Protection Act seek to withdraw federal protection for thousands of lakes, rivers or streams across the country, meaning new projects such as bridges or dams could take place on those waterways without an environmental assessment or public notification. 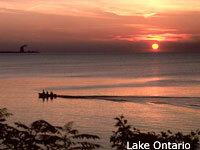 "The NWPA and navigation rights are integral part of Canada's environmental protection regime. If you take away the protection of navigation rights, you will impact the natural environment on Canadian waterways," said Will Amos of Ecojustice. "This is not a wise thing to do, even in tough economic times." 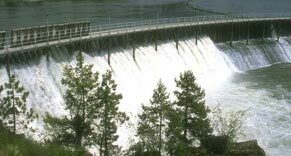 Manitoba Water Stewardship and Manitoba Hydro have started steps for permanent water power licences to allow water use for several dams in the Churchill River Diversion (CRD). The CRD has only interim licences for water power, and the dams have no environmental licences. No cumulative impact assessment for 30 years operations has been done either. The same is true of other dams in the province - at Grand Rapids, and along the Winnipeg River. Surveys for water power reserves/ licences on Manitoba lakes and rivers are still incomplete or not public. Recommendation 7.6: The Government of Manitoba require Manitoba Hydro to resolve all outstanding issues with regard to the Churchill River Diversion, the Augmented Flow Program and Lake Winnipeg Regulation. Following resolution of these issues, Manitoba Hydro should apply for the appropriate final licences for these three operations under The Environment Act and The Water Power Act as soon as possible. Recommendation 7.7: The application for the approval of final licences for Churchill River Diversion, Augmented Flow Program and Lake Winnipeg Regulation should include a review of the terms and conditions, an operational review and any required environmental impact assessments. Clear guidelines should be developed with respect to what constitutes conformance to and/or violation of the terms under these licences. Manitoba Wildlands, the Interfaith Task Force on Hydro Development, and northern communities believe the CEC recommendations mean both environmental and water power licenses and reviews must be undertaken. The CEC panel ultimately agreed with a public participants motion filed summer 2003, supported by public participants, that the Wuskwatim generation project area was insufficient, excluded impacts that would be felt elsewhere in the hydro (CRD) system. During the 2007 cabinet appeal of the Wuskwatim project licences, the director of environmental approvals under Manitoba's Environment Act confirmed that "The Minister of Water Stewardship has directed that outstanding issues related to the Churchill River Diversion project be addressed in order to allow for the consideration of the issuance of the CRD final licence under the Water Power Regulation under the Water Power Act." Water Stewardship Minister Melnick has confirmed that consultations with affected Aboriginal communities will begin soon, and that a public process for public comments and a public registry will be put in place. A September 17 meeting in Thompson, Manitoba, began the process with some potentially affected Aboriginal communities. A review of documents and correspondence shows that Manitoba Hydro is requesting the current interim water power licences be combined into one permanent licence, for 50 years. Currently Manitoba Hydro maintains that the generation stations in its system do not need any environmental permits or licences. The dams also were not grandfathered during the 1980s under Manitoba's Environment Act, as many other installations and plants were. No independant cumulative assessment of the CRD system, or generation stations throughout the province has been conducted. Manitoba Wildlands continues to expect the full intent of the CEC recommendation to be acted on. Environmental licensing in Manitoba occurs through The Environment Act. The Environmental Assessment and Licensing Branch of Manitoba Conservation is responsible for all stages of environmental licensing in Manitoba. See their licence application details here. In Manitoba, most major projects and development undertakings require an environmental license. Typically, these projects also require various other licenses or permits or authorizations under other provincial and federal legislation. The level of scrutiny for development projects that must undergo environmental assessment depends on the classification or 'class' of the development. The Classes of Development Regulation 164/88 defines various development projects as Class 1, Class 2 or Class 3 Developments and all developments described in the regulation require an environmental license. Manitoba Wildlands is collecting licenses for the existing hydro system, and dams in our province. Watch this space for further postings. The Canada-Manitoba Agreement on Environmental Assessment Cooperation(PDF) was signed by Manitoba and Canada in May 2000. The agreement expired in 2005 and the Canadian Environmental Assessment Agency (the Agency) initiated a process to revise and renew the agreement. A draft Canada-Manitoba Agreement on Environmental Assessment Cooperation (2005) was released in November 2005 and the public invited to comment on the draft. The public comment period closed December 16, 2005. On March 5, 2007, Canada and Manitoba jointly announced the signing of the renewed Canada-Manitoba Agreement on Environmental Assessment Cooperation. The renewed 2007 Canada-Manitoba Agreement on Environmental Assessment Cooperation builds upon the 2000 agreement and has been updated to reflect the amendments to the Canadian Environmental Assessment Act which came into effect on October 30, 2003. The agreement will remain in force for five years. Prior to its expiration, Canada and Manitoba will evaluate the Agreement and their performance in relation to it, after which time it will either be renewed or terminated. The evaluation will include opportunities for public consultation. In late 2001 and early 2002 a consultation was undertaken to identify a variety of amendments to Manitoba's Environment Act. The records of this public review, including the discussion paper, and final report on the consultation are held in Manitoba's public registry. As of February 2003 no amendments to the Act have been made public, or tabled in the Legislature. The context for these proposed amendments and the review is the COSDI report. In early 2006 a series of amendments to Regulation 164/88 under Manitoba's Environment Act were placed in the public registry for comment. These largely pertain to enabled wind turbine projects in Manitoba, without public hearings, regardless of size of the project or potential impacts from the project. Currently Manitoba is making licensing decisions regarding wind energy projects without arriving at public environmental standards, or undertaking public hearings for wind energy projects, ethanol plants and other alternative energy developments. Manitoba Wildlands responded to the request for public comments on the changes to the regulation above. The public comments letter includes 4 previous sets of formal correspondence from Manitoba Wildlands that are pertinent to the current regulation review. The National Energy Board of Canada (NEB) is an independent federal agency responsible for monitoring and regulating several aspects of Canada's energy industry. NEB responsibilities include the regulation of electricity exports to the United States, construction and operation of international transmission lines, and elements of the oil and gas sectors. The NEB also studies and monitors various aspects of the energy sector. The NEB's corporate purpose is to "promote safety, environmental protection and economic efficiency in the Canadian public interest within the mandate set by Parliament." It operates under the National Energy Board Act, with responsibilities under other sets of legislation as well. Manitoba Hydro has a series of NEB licenses that permit the company to sell electricity into the United States. (No NEB licenses are required for sale into Canadian provinces.) Manitoba Hydro also operates four transmission lines that connect with American markets. These also fall under the purview of the NEB. Export of energy to the United States is central to the operations of Manitoba Hydro. 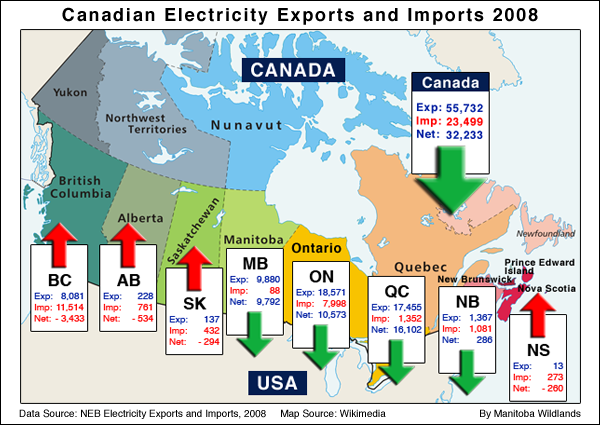 Between 1999 and 2004 Manitoba Hydro sold 30.5% of the energy it generated into American markets (measured by revenue rather than kilowatt hours). Between 2004 and 2008, that number slightly increased to 33%. Manitoba Hydro exports energy to dozens of American companies including Minneapolis-based Xcel Energy. Manitoba's mineral industry is dominated by nickel, gold, and copper mines with specialty minerals like cesium being mined more recently. The peat, sand and gravel, and stone industries are also active in the province. Exploration for diamond have occurred in the last 10 years. 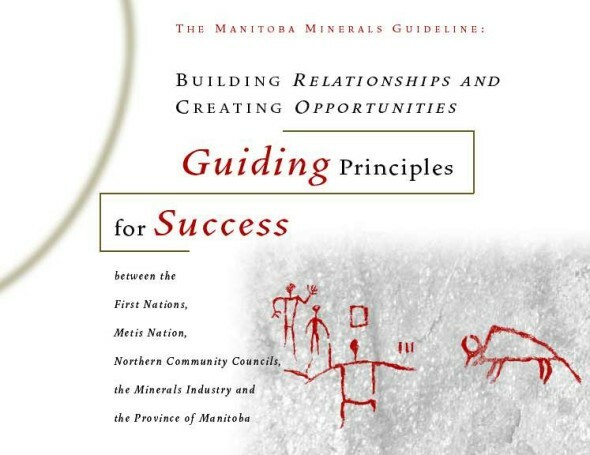 In 1999, Manitoba's Minerals Guideline: Guiding Principles for Success was confirmed. Access the Guideline at ITM - Manitoba Minerals Guideline. Mining in Manitoba is governed by the Mines and Minerals Act - a relatively new piece of legislation. It was initially developed and enacted in 1991-92 and has been amended since then. The Act reflects some progressive environmental and social concepts such as sustainable development and acknowledges the rights of those who occupy lands (prior to any activity to secure mining tenure), and the public's right to access information. The Mines and Minerals Act includes a section that gives the Minister discretionary power to withdraw open Crown mineral land from exploration, staking and lease (Mines and Minerals Act, Section 14(1)). This is important because it gives the Minister considerable power to close areas of the province to mining (by issuing an order that results in a regulation). In most other jurisdictions, all lands are open to mining activity unless closed through other legislation (for instance legislation that prohibits mining activity in parks and/or protected areas). 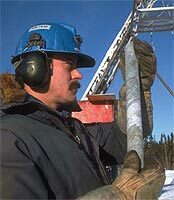 Through this Manitoba legislation, (Section 52(1)) Cabinet has the power to make regulations that designate areas for which mineral exploration licenses may not be given. The object and purpose of this Act is to provide for, encourage, promote and facilitate exploration, development and production of minerals and mineral product in Manitoba, consistent with the principles of sustainable development. The National Mines Ministers Conference (MMC) was held in Winnipeg September 17, 18 2002. Each year all governments in Canada, represented by ministers responsible for mining, meet to discuss common challenges and policy initiatives. The theme conference was, "The Top Three Priorities: Sustainable Development of Mining in Canada". Gaile Whelan Enns, Manitoba Director, Wildlands Campaign, Canadian Nature Federation made a presentation entitled, "Manitoba's Protected Areas Commitments, The Mining Sector Consultation - Working Toward Sustainability" . Her presentation provides background about the Manitoba Mining Sector Protected Areas Consultation. It provides a history of the consultation and describes the technical basis used, partners involved, and mechanism to rank areas for protection. 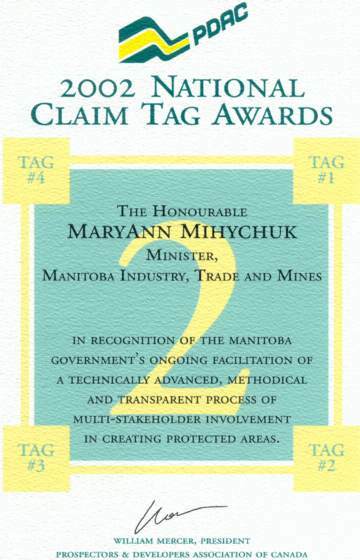 During the September 2002 National Mines Ministers' conference in Winnipeg, the Prospectors and Developers Association of Canada (PDAC) presented Manitoba Minister Mihychuk its annual 'claim stakers' award. This award acknowledges Manitoba's multi year mining sector consultation for the establishment of protected areas. It also acknowledges the government of Manitoba for its participation in the mining sector's protected areas consultation. Each year the PDAC 'claim stakers' awards acknowledge government actions and public policy initiatives for the mining sector. The Manitoba Geological Survey web site contains information about all current dispositions and properties in Manitoba. Their Map Gallerycan be accessed at ITM - Geological Survey - GIS map gallery. Article: "Sustainable Development" - What's in a name? Quite a lot actually, labels matter! Manitoba Conservation and Water Stewardship is currently conducting an online "consultation" on a proposal to replace Manitoba's Sustainable Development Act (1998) with a new Act, tentatively called the "Green Prosperity Act". We recall that the commitment to the Legislature in the 2009 Throne Speech was to "modernize" the SD Act, not to replace it. While we agree that the SD Act could perhaps use a modest refresh, the proposed "replacement" raises questions. The previous "TomorrowNow" (Green Plan) online consultation apparently had an "overwhelming" response, but so far there has been no public accounting of comments by way of a "What You Told Us" document, a common step in public consultations. Individuals and organizations that took time to comment remain largely unaware of what other respondents’ proposals were or what areas of consensus or disagreement emerged from the exercise. Manitoba's Sustainable Development Act includes a set of principles and guidelines. We are posting access to the Act, significant reports, public policies, and initiatives identified by government as being part of sustainable development for Manitoba. From 1997 to 1999 the Manitoba government undertook the Consultation on Sustainable Development Implementation (COSDI). Many of the recommendations from COSDI are the basis for current sustainable development policy and regulatory changes. It should be noted that environmental organizations did not sign off on COSDI. Also the intended public consultation regarding COSDI recommendations has not occurred. Please see our Links and Governments pages.